Our History, Our Heritage was a black-led Bristol group promoting historical awareness of the contributions of African, African-Caribbean and British peoples in past and present struggles, and in Bristol in particular. Their series of talks and educational initiatives sought to encourage 'creative education in Citizenship and British, Afrikan, Afrikan Caribbean History', taking inspiration from 'those who have gone before'. Manor House Museum in Kettering, in collaboration with local community groups, produced a touring exhibition which explored Kettering's involvement with the anti-slave-trade movement and issues of modern day slavery. 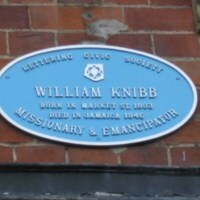 The museum focused in particular on the life of ​William Knibb (1803-1845), a missionary from Kettering who taught slaves in Jamaica in the 1820s against the will of local slave owners and toured Britain speaking out against slavery. The museum produced a loans box containing material relating to Knibb and continues to have a permanent display dedicated to the missionary. 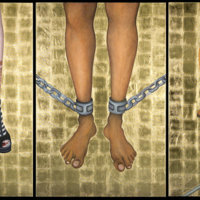 'House Slave - Field Slave: A Portrait of Contemporary Slavery' was created in 2007 by Nicola Green in collaboration with Anti-Slavery International and first exhibited at Dulwich Picture Gallery. The artwork explored the concept of contemporary slavery and the stories of those still enslaved. The exhibition consisted of a large 'altarpiece' scale triptych set alongside artefacts of contemporary slavery from the International Slavery Museum and photos and text from Anti-Slavery International. 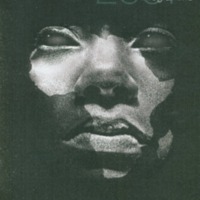 It was later exhibited as part of Haringey's Black History Month at Bruce Castle Museum in 2010. The triptych is now in the permanent collection at the International Slavery Museum in Liverpool. Workshops were held at Dulwich Picture Gallery, The Prince’s Drawing Clubs, and International Slavery Museum in which students developed their skills in reading a work of art as a narrative, and responded by creating artworks that told their own personal story. 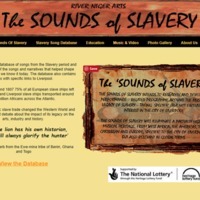 The Sounds of Slavery was a project by the performance and visual arts group River Niger Arts to research, record and develop a performance-related programme around the musical heritage and legacy of slavery. The project took particular interest in these themes in relation to the City of Liverpool, but also addressed them in global terms. 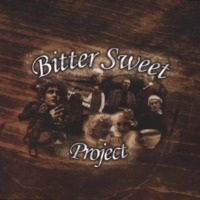 The project created a database of songs and narratives from the period of slavery. Members of the River Niger Orchestra also performed at a Sounds of Slavery performance at Liverpool Hope University. Some of the songs performed included 'The Chase', 'No More Auction Block' and the African American spiritual 'The Jubilee Song'. The project was accompanied by a series of performance and visual arts education workshops with schools. The National Maritime Museum marked the bicentenary with a range of initiatives and events including a new exhibition, a film season, poetry, music, debates, and new publications. A new permanent gallery opened at the museum in winter 2007 exploring Britain's Atlantic empire. A catalogue of slavery-related images, artefacts and documents from the collections of the museum, 'Representing Slavery', was published. The museum also devised a transatlantic slavery trail around Greenwich. The National Maritime Museum hosted a number of events throughout 2007. The theme of the weekend 23-25 March was 'And still I rise', marked with a series of activities, performances and discussion. On August 23, International Day for the Remembrance of the Slave Trade and its Abolition, the ‘Freedom Festival: Contemporary Commemoration’ event saw a programme of creative events and performances exploring themes around the heritage of enslavement. The museum also offered a range of learning experiences based on its collections. For example, in November, a study session, 'Roots of Resistance: Abolition 1807' examined the roots of resistance and the abolition movement through talks by curators and contemporary artists. Activities for families were based on themes of freedom and carnival. 'The Big Conversation 2007' was a programme of debate and showcasing of diverse projects undertaken by students around the country, organised by the Understanding Slavery Initiative and the Department for Children, Schools and Families. The official publication from the British Government in response to the bicentenary included a message from Prime Minister Tony Blair. It set out the history of transatlantic slavery and resistance to it, and featured a calendar of upcoming events for 2007 relating to slavery and abolition. The publication also detailed contemporary efforts to end modern slavery. 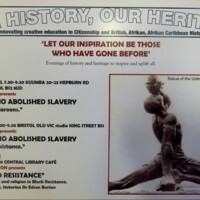 Later in 2007, 'The way forward: bicentenary of the abolition of the Slave Trade Act 1807-2007' reflected on some of the commemorative activity that had taken place in Bristol, Hull, Liverpool, London and Greater Manchester. 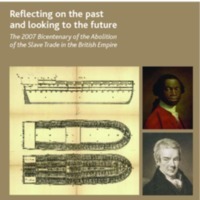 With a foreword by the new Prime Minister, Gordon Brown, the theme of the publication was 'Reflecting on the past, looking to the future' and it linked efforts for the abolition of historical and contemporary slavery. The publication also looked to how to tackle inequality and poverty in the UK, Africa and the Caribbean. The official publication to mark the bicentenary from the Department for Culture, Media and Sport (DCMS), setting out the Government response to the commemorations. This included the formation of a 2007 Bicentenary Advisory Group, chaired by the Deputy Prime Minister John Prescott MP, to co-ordinate a national response to the bicentenary and to UNESCO International Slavery Remembrance Day on 23 August. The Group was made up of a number of influential stakeholders to encourage action across the cultural, community and faith sectors and ensure that the bicentenary was made relevant to local communities. Participating organisations included Anti-Slavery International, Amnesty International, the Archbishops Council, Bristol City Council, Churches Together in England, the Equiano Society, the Evangelical Alliance, National Museums Liverpool, National Maritime Museum, Museum of London, the Wilberforce Institute for the study of Slavery and Emancipation and several faith and community leaders. 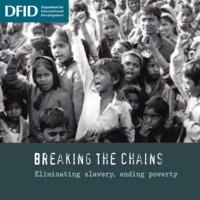 The official publication to mark the bicentenary from the Department for International Development, with a particular focus on the links between poverty and forms of modern slavery around the world. In this website and Key Stage 3 Resource Pack, the City of London Festival examined the work of the Afro-European violinist George Bridgetower (1778-1860) and, in particular, his relationship with the composer Ludwig van Beethoven. The resource also explored the role of other artists, writers and musicians who were active at the same time as Bridgetower, with a special focus on their relationships to the anti-slavery movement. The website provided music, video clips and worksheets, alongside an interview with Julian Joseph, composer of the jazz opera Bridgetower - A Fable of 1807, toured by English Touring Opera. 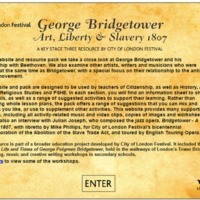 The resource was part of a broader education project developed by City of London Festival, which included the exhibition, 1807: The Life and Times of George Polgreen Bridgetower, held in the walkways of London's Tower Bridge. The education project also included storytelling, music and creative writing workshops in secondary schools. 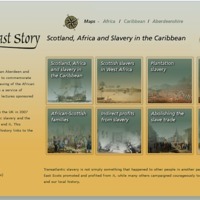 This online exhibition and learning resource linking the history of transatlantic slavery to North East Scotland was organised by an Aberdeen and Aberdeenshire Bicentenary Committee, including representatives from Aberdeenshire Council, Aberdeen City Council, the University of Aberdeen, the Robert Gordon University and the African and African-Caribbean communities. It followed on from a service of commemoration and a series of public lectures sponsored by the Committee in 2007. The exhibition logo is inspired by the mythical Sankofa bird, a cultural symbol of the Akan-speaking peoples of Ghana in West Africa. Featured here are a number of resources available to download from the North East Story website. Breaking Chains - Sheffield Civil Rights was a project by Sheffield Galleries and Museum Trust to look at the slave trade and to celebrate Sheffield’s heritage by exploring the role local campaigners played in securing workers' rights. The resources targeted Key Stage 2 pupils. There was a particular focus on the visit to Sheffield by the African abolitionist Olaudah Equiano in 1790. 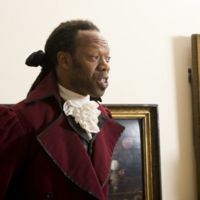 Actor Joe Williams played Equiano in a dramatisation still available to view on the teaching resource. Featured here are some of the downloads available. 2007 saw a number of different projects taking place at Harewood House in West Yorkshire, home of the Lascelles family. 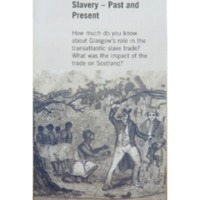 The bicentenary was used as an opportunity to explore the family connections with the transatlantic slave trade and the sugar plantations of the West Indies. To spotlight Harewood House's historic links with the Caribbean and carnival, in September 2007 a production of Carnival Messiah was held in a Big Top in the grounds. 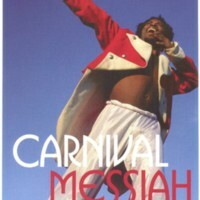 Carnival Messiah is a reinvention of George Frideric Handel’s oratorio Messiah as carnival theatre and heritage experience. The West Indian celebration features dancers, singers, masqueraders, musicians and actors. Stories from the Caribbean folk tradition, medieval mystery plays and African ritual combine with contemporary popular music and dance styles, including gospel, calypso, reggae, jazz, hop hop, bhangra and steel band. Geraldine Connor was Creator and Artistic Director and David Lascelles of Harewood House was Executive Producer. A community education and outreach programme ran alongside the project. Campaign! Make an Impact was a British Library developed programme that used history to inspire young people into active citizenship. The Bitter Sweet Project involved students from Easingwold School engaging with collections from the British Library, Hull Museums Service and Harewood House. Year 9 students studied the 1807 campaign to abolish the transatlantic slave trade and then created a graphic novel about Harewood House’s links to the sugar trade. To mark the bicentenary, Manifesta (a not for profit company delivering projects addressing cultural diversity) and the Runnymede Trust (an independent policy research organisation focusing on equality and justice) joined forces to launch a youth and digital media initiative, Video ART (Anti-Racist Trails) Postcards. The project explored connections between slavery, colonialism and contemporary issues of racism and related injustice. In the summer of 2007, two groups of teenagers aged 14-19 from the London Borough of Newham participated in workshops to uncover sites related to historical racism and anti-racism in the West India Docks area of London, assisted by video artists and historians. 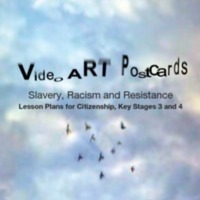 Using video for self-expression, each participant interpreted this history and heritage by producing a short personal video or 'postcard' - there were 33 videos in total. The videos were made available on an online resource, and a Teacher's Guide was created to be used alongside the website. In consultation with local community groups, in 2007 the Natural History Museum commissioned new research into its collections that link slavery and the natural world. The research uncovered experiences of enslaved people and the use of plants in their everyday life, as food, medicines and poisons. It also examined the complex relationships between enslaved people and naturalists exploring newly-colonised lands. The museum ran a series of public events, co-hosted by Race on the Agenda, which aimed to bring the historical, scientific and public viewpoints together. It created online educational resources on themes such as Commercial Plants, Everyday Life, Diet and Nutrition, and Resistance. The museum also developed cross-curricular ideas for school lessons in Science using the context of slavery, looking at foods across different cultures, for example. The Southwark 2007 & Beyond Steering Group was established to correct perceived misinformation about Britain's role in perpetuating slavery, and to promote education and dialogue on anti-slavery resistance and human rights. 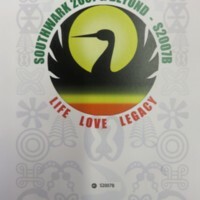 The Steering Committee was composed of representatives from Southwark's Afrikan, Afrikan Caribbean and Afro-descendant communities, and the year-long programme of events was funded by Southwark Council. August 2007 was a key month of the commemorative programme, focused on 23 August, the United Nations International Day for Remembrance of the Slave Trade and its Abolition, and the anniversary of the beginning of the Haitian Revolution. A 'Vigil of Remembrance, Resistance and Repairs' included speakers, performances and a libation ceremony. Other events included 'A Bicentennial Dialogue' featuring a keynote address by Dr Joy DeGruy-Leary. The publication 'Abeng Soundings: Abolitionist Landmarks of our Freedom March', co-authored by Esther Stanford of Rendezvous of Victory, provided an overview of the resistance efforts of African freedom fighters against slavery. Hammersmith and Fulham Urban Studies Centre is a voluntary educational organisation which offers opportunities to children and young people to learn about the local urban environment. 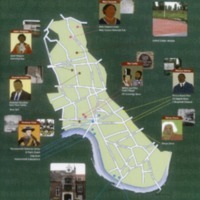 The online curriculum resource 'Remembering Slavery' aimed to inform teaching and learning about the transatlantic slave trade by tracing the links of people and places in Hammersmith and Fulham to enslavement, the slave trade and its abolition. It explored the lives of enslaved Africans and their descendants, detailing their experiences and contributions in the local area. The resource aimed to encourage teachers to develop a locally-based Black history focus across curriculum programmes. It consisted of resource guides and animated films across four broad time frames: pre-Victorian, Victorians, Britain in the 1930s and 40s, and Britain since 1948. TimeLine magazine is a lifelong learning project centred on exploring the history and heritage of Hackney through stories, games, interviews and memories. The magazine is distributed free to schools, libraries and healthcare providers. 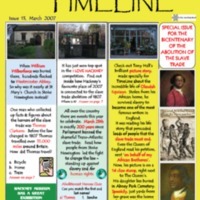 In March 2007 a special issue of TimeLine examined the bicentenary of the Abolition Act 1807, and Hackney connections to abolition. The special issue included a picture story of the life of Olaudah Equiano. 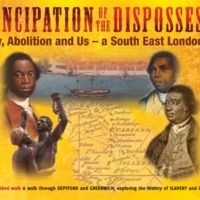 Emancipation of the Dispossessed was a local community project exploring the local history of Deptford and the surrounding areas and the connections with the transatlantic slave trade. Community groups and students from Lewisham College worked with theatre educators to research and develop 'Blood Sugar', a promenade performance through the Queen's House, Greenwich. The play, written and directed by John Turner, tells the story of slavery and abolition from a local angle, and the script was built around first-hand and eyewitness accounts, campaign pamphlets and reports to parliament. The project also produced learning resources aimed at Key Stage 3 History and Citizenship. A guided walk explored Deptford’s links to the history of the transatlantic slave trade, uncovering stories of some of the local people who played an important role in the beginnings of the slave trade or the campaign for its abolition. London was an important slave trading port before Bristol and Liverpool dominated the trade. The trade and British colonies were protected by the Royal Navy, whose ships were built and prepared for voyages at the Royal Dockyards at Deptford.